I, not unlikes the rest of the U.K, am currently snowed in my house. Which is slightly ironic considering I’d started writing this blog entry about social gaming in the wider world and now I can’t get out anywhere! 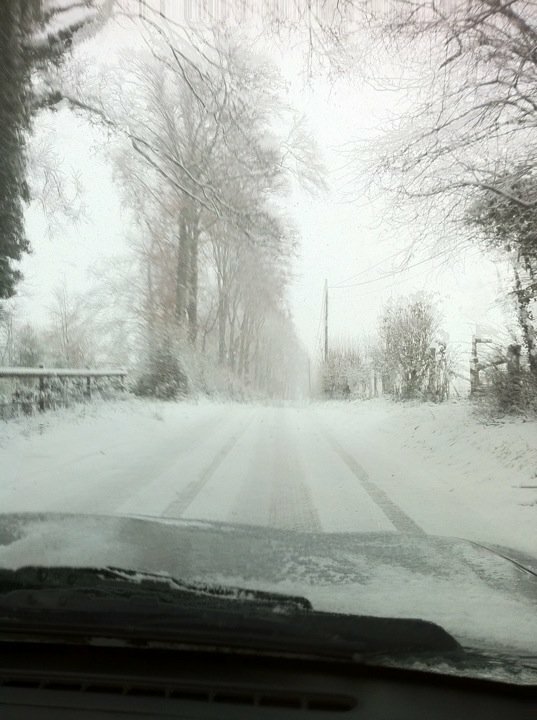 The view from my car after I stopped skidding down the drive at Polesden Lacey yesterday afternoon. 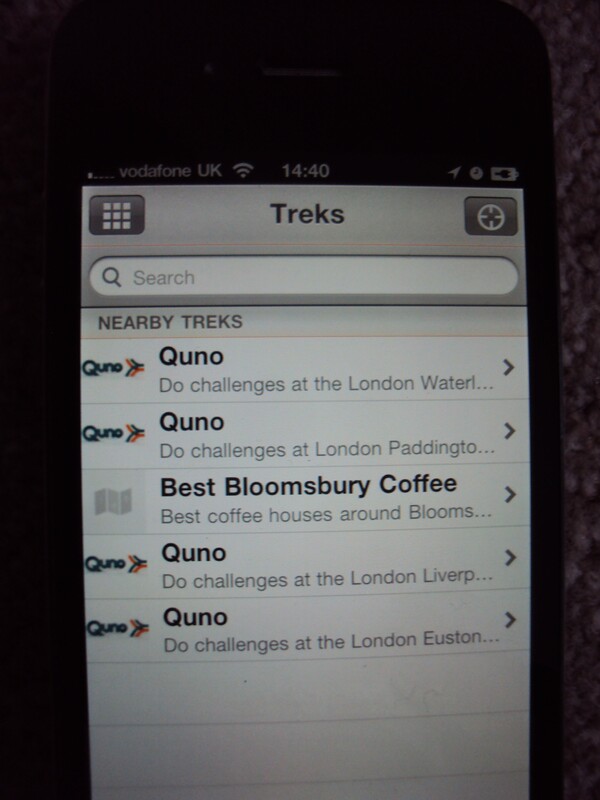 When I first started this blog I was quite excited about the opportunities of using foursquare. With it’s ability to leave/read others comments and tips as well as offer of freebies to regular visitors it seemed like a good way to engage people with perhaps things they might miss or tips about properties. I’ve been using it for well over a month now and although it started out as a semi amusing competition with my girlfriend about who could get the most points and most badges (until she started cheating by creating her own unique locations and checking in to them constantly). After a couple of weeks it has become a quite empty experience and our use has quickly dropped off. 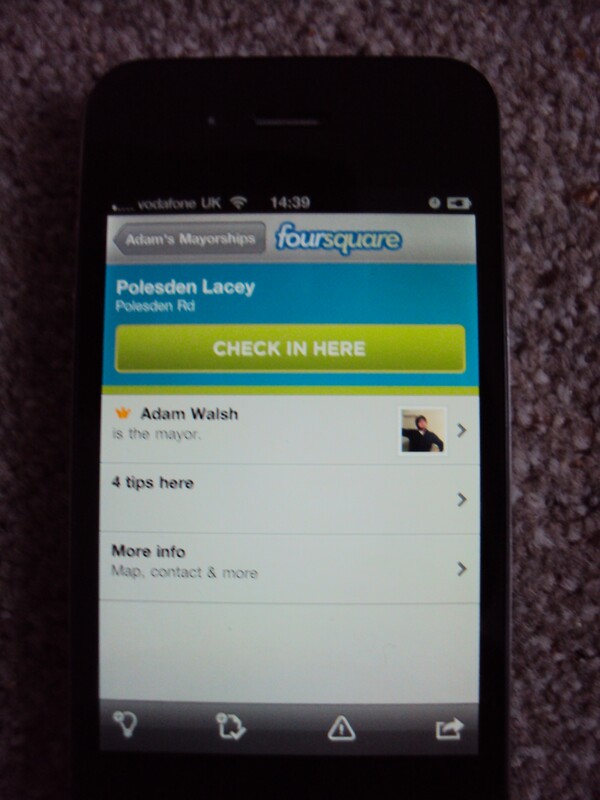 My unchallenged mayorship of Polesden Lacey, not a rewarding experience. The issue being with foursquare is that it’s a very passive experience and I for one quickly lost interest with it. This is perhaps where new rival scnvgr will overtake the likes of foursquare and facebook places. Scnvgr arrived in the U.K a couple of month ago and is teamed up with google and travel brand Quno. On the surface it works just the same as foursquare/facebook places with it’s system of checking in to locations to gain points and badges. 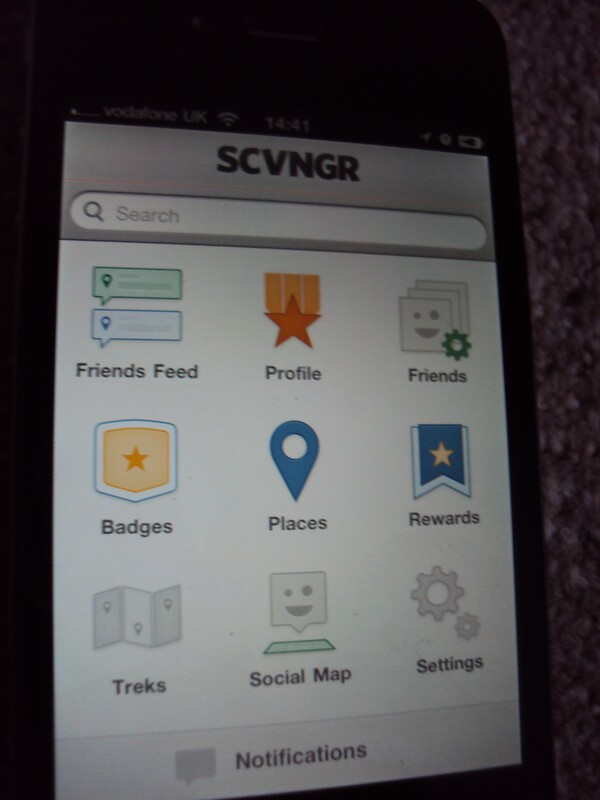 A possible rival for four square, scvngr adds challenges which would lend itself more easily to use in museums etc. Where scnvgr may take the lead however is coupling this with challenges at locations including the basics; checking in, checking with another person, taking a photo and of course saying something. Each challenge gains points, and individual and companies can create challenges. However it doesn’t stop there, companies can also create treks which involve completing challanges at a number of locations something which would lend itself particularly to the Museum Sector. In fact the Smithsonian already has a trek, check it out here! Of course there are also issues we face when using new technology and app’s such as scvngr at National Trust locations. Not all places allow taking photos in doors, there are issues regarding individual items in collections with regards to loan agreements and of course the ever present issue of getting a signal.